Barry M is probably one of my favourite drugstore/high street brands for nail polish. They always have a great shade range and more recently they've been coming up with new formulas which are all the rage at the moment. 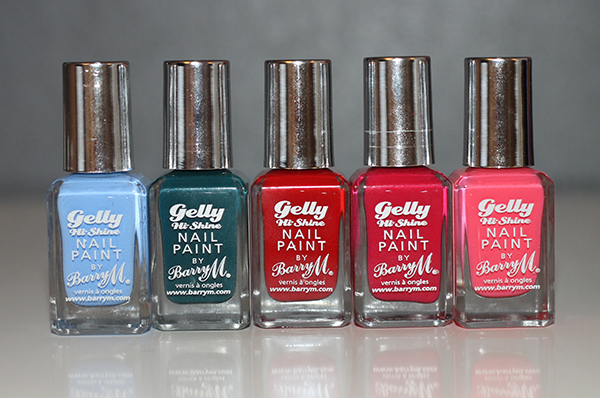 I first tried the Hi Shine Gelly range last Christmas but since then they've brought out more shades to choose from. What makes them different is their high shine, chip resistant formula that lasts really well on the nails. The colours are also extremely pigmented so you can get away with only applying one coat. I don't have many reds or pinks so I decided to pick more of those up. From the swatches, each colour is only applied with one coat. All of the colours will be great for summer but I have to admit, I was a little disappointed with the Blood Orange colour (middle) as it’s more red than I expected but that is the only downfall. As for the chip resistant quality, I get approx 5-7 days wear without chipping which is amazing! If you can get your hands on these, definitely pick them up. I've got my eyes on a couple more shades! What gorgeous shades! Especially Watermelon. I have yet to try Barry M nail colours.